The dramatic development of municipal solid waste (MSW) incineration recently has brought a surge in the generation of air pollution control (APC) residues, a kind of hazardous waste. Landfilling after stabilization of APC residues plays an essential role in the hazardous waste management. Few studies have focused on the leachate quality of mono-landfills for stabilized APC residues in China. 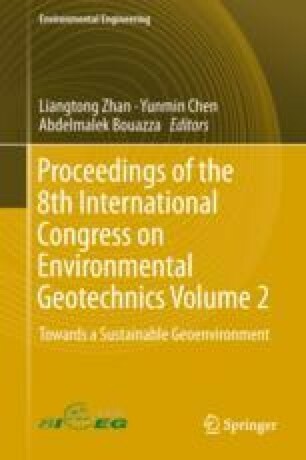 This investigation concentrates on simulating mono-landfills by percolation leaching tests in a pilot scale, the leachate quality data from which could offer fundamental basis both for the design of mono-landfill sites (if leachate would be generated) and chemical stabilization processes. Moreover, granulation of the stabilized APC residues could offer a fairly better working condition for transportation and landfilling operation; thus, another purpose of this work is to analyse the leaching behaviour of contaminants and tentatively conclude the effect of granulation on the leachate characteristics of stabilized APC residues in mono-landfill site. Three models were used to describe the leaching rate of the specific contaminants in landfill sites. We thank Haohao Zhang, Yuan Gu, Jiawei Zeng, Xiangxiang Cheng, Jianchen Li, Yang Liu and Junda Ren for help in the laboratory. We’d also like to thank Changzhou Domestic Waste Treatment Center for the experimental site. This study was financially supported by scientific and technological projects of Urban-Rural Development of the People’s Republic of China (No. 2016-K4-001).